These days setting up your own Home Aquarium does not necessarily means you need to spend a lot of money. If you are interested to own your first aquarium while at the same time working on limited budget, you can always take some time to shop around and search carefully for all the necessary supplies and equipment before making up your mind. Buying and then setting up a home aquarium is not a difficult task. The fact is, it doesn’t really cost a lot at all and with a budget allocation of let’s say $300, that should be more than enough for the whole complete home aquarium set. Let’s look at some of the basic items and estimated price for each of it. Aquarium Fish Tank – Depending on whether it is glass or acrylic, the price can be as low as a hundred up to thousands of dollars. If you are a novice, I would suggest getting a standard size of 20-gallon which should be enough to house a small community aquarium and that should cost only $120 dollar with an acrylic type. 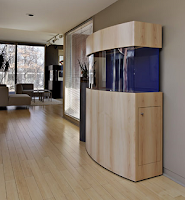 Aquarium Stand – An aquarium stand is needed to provide support for your fish tank. A simple stand which costs about $70 will be more than enough. Aquarium Filter - Price range can be between $30 to $70 depending on the type and model that fits according to your aquarium size. A filter is needed to ensure that debris is filtered out and water stays clean and clear. The filter media is also a place for growth of beneficial bacteria. Let's allocate a budget of $50 here. Air Pump - works to generate air bubbles and to agitate the water surface for exchange of gas. Should cost only about $10. Anything above that is not necessary. Lighting – Is needed not only for your live aquarium plants but is also beneficial for the fish to bring out the colors. For a simple home aquarium with a barren tank setup without plants, a fluorescent type lighting, which cost only about $30 (for 14watts specification) should be more than sufficient. Water Conditioners – For Chlorine removal and softeners. Expect to spend around $5 for this. Fish Food – $10 allocation should be more than enough.